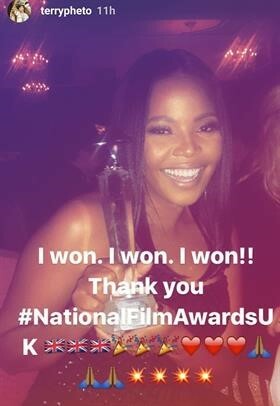 Congratulations Terry Pheto for winning an award. The actress has won the award for Best Supporting Actress at the National Film Awards UK for her role in A United Kingdom. Terry expressed her excitement and posted a photo alongside with her award on Instagram. she wrote, "I won. I won. I won. Thank you #NationalFilmAwardsUK."